Acme Sponge Company Sponges include natural sea sponges. And natural sea sponges contain enzymes that inhibit the growth of bacteria, mold and mildew. Natural sponges are naturally toxin-free, hypo-allergenic, softer , more durable and resistant to abrasion. Natural sea sponges soak up and hold more water, without dripping, and are self-cleaning. And because sea sponges are soft, absorbent, durable, non-toxic and hypo-allergenic, they are the best solution for natural skin care. Choosing the right sponge for you and your use is essential, and having an environmentally-friendly product available makes all the difference. That’s why Acme Sponge Company sponges include many different types of high quality natural sea sponges. Our sponges are a sustainably harvested, quickly renewable natural resource that is 100% biodegradable. They contain natural enzymes that naturally inhibit the growth of bacteria, mold, mildew and the associated odors. Polyester sponges were invented as a result of the discovery of polyester in 1937 by Otto Bayer. Polyester sponge material was originally adopted by the mop industry, which needed a cost effective, absorbent, strong, durable, material that was resistant to harsher cleaning chemicals, oil, and grease. The airy foam, which is similar in structure to natural sea sponges, but more chemically resistant, was then made into utility and kitchen sponges. Polyester sponges remain soft even when dry, are resistant to solvents and chemicals, float, and can be sterilized by boiling. Polyester sponges are elastic, light, economical and durable. And like sea sponges, are extremely soft and come in a variety of shapes and sizes for different types of jobs. The honeycomb structure of polyester sponges make them super-absorbent ideal for professionals for masonry, drywall, wall papering, tile and grout work, painting and general cleanup. Because of its chemical resistance, flexibility, elasticity and utility, this sponge can be used for all types of masonry, painting, texturing, as well as general cleaning projects. These characteristics also make this type of sponge the obvious choice for all general home, auto and marine applications. As a chemical term, Polyester can be broken into poly (meaning many), and ester, (referring to a basic organic chemical compound). A synthetic compound derived from petroleum, water and coal, Polyester was developed in a 20th-century laboratory. Polyester is formed from the chemical reaction of alcohol and an acid where, two or more molecules combine into a larger molecule with a structure that repeats throughout its length. Ethylene, the primary ingredient used to manufacture polyester, is derived from petroleum. In this process, ethylene is the polymer used in a polymerization process to create the finished polyester. These long chain molecules are extremely strong and stable. Cellulose sponges are one of the most common types on the market. They are available in a variety of sizes, shapes, colors and types, are inexpensive, durable, soft and versatile. Many “kitchen” sponges used for cleaning and dishes are made of cellulose. Cellulose sponges, which are made from a form of wood pulp, are not only durable, but 100% biodegradable and sustainable. Cellulose sponges are exceptionally absorbent, great at holding liquid, and work well on a variety of different types of surfaces. And because they are made from cellulose they are made from a sustainably harvested natural resource, disposable and 100% biodegradable. Cellulose sponges work well for a variety of household and commercial applications. Cellulose sponges are used for all types of household chores including general cleaning, kitchen and bathroom. Cellulose sponges are the most common type kitchen sponge. They are used for dish washing, cleaning counter-tops, sinks, appliances, floors and more. In addition to kitchen use, cellulose sponges also work well for bathroom cleaning of showers, tile, sinks, countertops and glass. And although the sponge can be sterilized with heat or an antibacterial soap, cellulose sponges should not be used to wipe up bacteria rich material such as raw egg or raw meat juices, as dangerous bacterial growth can occur. In addition to kitchen and bathroom use, cellulose sponges are also used by tradesman and do-it-yourselfers for various applications including drywall, wallpapering, tile and grout, pottery making and for all types of home projects. Cellulose sponges are made from a mixture of hemp fibers, sodium sulphate crystals, softeners, and wood pulp (cellulose). Flax and other materials are added to some formulations to provide added chemical resistance, strength or other desirable properties. The process of manufacturing cellulose sponges begins with large stiff sheets of Cellulose. The large sheets are mixed with softeners in large vats of water to create a soft jelly-like slurry that is then mixed with sodium sulphate crystals and dye. Once the ingredients are thoroughly mixed, they are poured into a mold and heated. The sodium sulphate crystals melt as the mixture is cooked and drain out through openings in the bottom of the mold. The porous texture of cellulose sponges is created by holes left by the melting sodium sulphate crystals. The size of the sodium sulphate crystals is what determines the size of the pores in the finished sponge. Sponges manufactured for washing a car, which need to be more porous, are made with larger crystals, while finer pore sponges, like those used for applying makeup, are made with finer crystals. The heated cellulose mixture is then cooled and hardens into a porous block that is then soaked in a mixture containing bleach to remove any remaining dirt or other impurities. Bleaching also brightens the color of the cellulose. After bleaching, the block is washed repeatedly with water, until the desired pliability and texture are achieved. After the sponge block is dried, it is cut into the appropriate size sponges and packaged for sale. Sea sponges are well known for their excellent absorption, soft texture, and durability. Because they produce a thick, rich, creamy lather sea sponges are ideal for kitchen use. The natural porous structure of a sea sponge creates a large amount of nap, for a deeper clean and a softer touch. So not only are they a great option for washing everyday dishes, glasses, appliances and counter-tops, they are also the best choice for cleaning more delicate items such as fine china, crystal, and non-stick coatings that can be scratched by standard kitchen sponges. And unlike artificial sponges, sea sponges naturally inhibit the growth of bacteria so, as long as they are thoroughly rinsed, will not develop the unpleasant odor normally associated with kitchen sponges. They are also 100% biodegradable, do not contain chemicals (like most kitchen sponges), are environmentally safe, and very durable and economical. Natural sponges make hand washing glassware quick and easy because they can be compressed and pushed into glasses where other products or hands and dishrags are difficult to reach. Sea sponges are also great for cleaning bowls, and getting into the corners of cookware and dishes. Simply drop a small amount of soap onto a wetted sponge vigorously massage into a thick, rich, foamy lather. Sponges are native to the coastal waters of Florida and have been used by different cultures around the world for more than 2,000 years. We process our sea sponges for maximum durability, strength and water absorption. Our Sponges, or sponge “cuts”, have been cut in two in order to increase the working surface area and provide additional value. These are not whole sponges, or “form” sponges, intended for decoration. Natural sponges are a sustainably harvested, quickly renewable natural resource and as with any natural product will vary in color, size and shape. Sea Sponge painting is a centuries-old technique that adds a more textured look to a surface. One of the easiest methods to learn, sponge painting is an inexpensive way to add a customized look to a room, and also serves to hide any flaws or repairs. Sea sponge painting, or “Sponging”, creates the appearance of depth and texture that can be, depending on the technique, either subtle or pronounced. This faux painting technique creates the illusion of dimension and old-world feel by adding extra layers of color. And it is the porous nature of the surface of a natural sea sponge that creates this classic effect. There are two different types of sponge painting techniques, sponging on and sponging off. The sponging on technique is the application of glaze to the walls using a sea sponge. 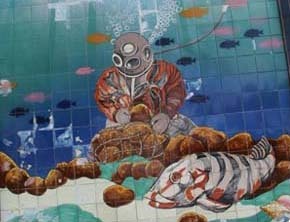 While the sponging off technique uses a sea sponge to remove glaze from the wall that has been applied with a roller. The sponging on technique creates a more porous or mottled appearance. And the sponging off technique results in a more subtlety textured surface. Because the sponge painting method uses a minimum of two different colors (i.e. a base coat and an accent color) it creates the illusion of depth and any defects in the surface virtually disappear. Professional designers and decorators, as well as DIY homeowners, often use this easy sponge-painting technique to create additional visual interest or a classic Old-World feel in a room. Practice this technique with your color choices on a piece of board before applying it to the walls, to perfect this technique. The first step in the sponging on faux painting process is applying the base color. Once the base color is completely dry, a damp sea sponge should be dipped in the accent color, but should not be dunked completely. The sponge should only be dipped on one side so that the edges have all been covered with paint. The porous pattern of this faux technique is achieved by the dry spots and pores of the sponge that do not transfer paint to the surface. Once the sponge is coated, gently dab the sponge on the wall, pressing lightly. The paint should be dabbed on in a random pattern and spaced apart. The sponge will need to be recoated periodically, just like a paintbrush or roller. Because the first dab after recoating will transfer more paint than the last, these should be spread out over a large enough area that a regular patter is not created. Dab the paint closer to create a denser look of spread apart further to soften. Take care not to apply too much paint or dab too close together or the faux effect will disappear into a more solid look. Accent colors tend to dry fairly quickly, so more than one accent coat or color can be applied after a short duration. However, ensure that the last coat applied is completely dry before applying the next or the accent coat will smear and ruin the affect. It is also important to leave enough space between dabs of one accent color, if multiple colors are to be applied. With just a bit of practice, this technique is easy, quick and creates an effect that is limited only by the painter’s imagination. 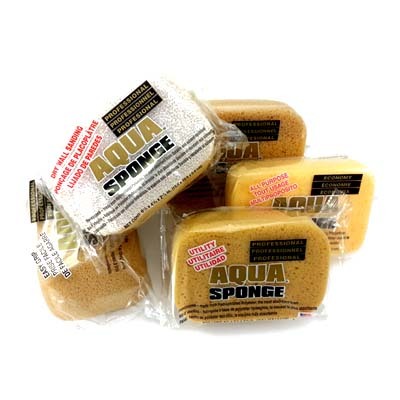 Sea sponges are ideal for washing all types of vehicles. The finishes of cars, trucks, motorcycles, boats and airplanes can all be scratched, or marred, if not cleaned properly. Because natural sea sponges are extremely soft and porous, the have the ability to effectively and efficiently clean these types of finishes without scratching. Sea Wool sponges are best suited to cleaning vehicles finishes. Yellow sea sponges (Yellow refers to a type of sponge, not a color) are also well suited to cleaning vehicles and are more durable, but are a bit stiffer. These are best suited to cleaning areas that are less susceptible to marring or where a bit more scrubbing is required to get clean (such as tires, plastics, windows, bumpers, rims, etc…. Although natural sponges are coarse and stiff when dry, they become extremely soft and absorbent when wetted. The extreme softness of a wetted natural sea sponge is essential to protecting a vehicles finish. But it is also critical that any dirt or grit that is to be washed off the finish is not allowed to scratch it during the cleaning process. The thousands of pores that make up the surface of a sponge creates a large amount of nap (or pile). Nap is created by the small soft fibers that stick up from the surface of a material. These fibers pull dirt and grit away from the surface and then trap it inside the sponge, keeping it away from the vehicle’s finish where it would otherwise scratch it. The same pores also hold large volumes of soapy water, creating a buffer between the vehicle’s paint and the sponge itself. This adds yet another layer of protection for the vehicle’s finish. In addition to the soapy water buffer and nap created by the thousands of pores, the nature of cells that make up the surface of a sponge also allow it to release the dirt and grit it has trapped when rinsed. The ability to release the dirt and grit is an essential characteristic of any wash product (sponge, mitt, towel, etc…). If the accumulated dirt and grit is not released when the product is rinsed, it will become increasingly abrasive and over time will eventually scratch, or mar, the finish of the vehicle. The same types of cells that make the natural sea sponge such a great fit for cleaning vehicles, also make them extremely durable. A sea sponge used for washing vehicles can last for several years with normal use; making them a good value. Sea sponges are extremely durable and, with normal, use can last for years. But harsh chemicals (bleach, ammonia, etc…) should never be used with them. Not only will using harsh chemicals damage the sponge, it can potentially harm the vehicles finish as well. Always use a car wash soap (specially formulated for that purpose) to avoid damaging the sponge or the vehicle’s finish. When compared to other types of popular sponges, Natural sea sponges require less maintenance and better protect the finish. A natural sponge will dry out and be ready for its next use, after a quick thorough rinse to release any grit and dirt from the sponge. Natural sea sponges also release normally hard-to-remove brake dust, making it a great tool to quickly and effectively clean a vehicles rims. Because of the Natural sea sponge’s cellular structure, they are soft, absorbent, durable and release dirt and grit when rinsed, making them an ideal solution for washing your vehicles. 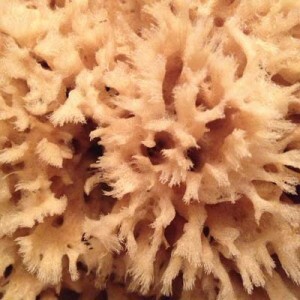 Natural sea sponges are a renewable natural resource, 100% biodegradable and, as such, environmentally friendly. A cut sea sponge will regrow within a few years and are often larger and healthier as a result of the process. In addition, natural sea sponges naturally inhibit the growth of bacteria, mold and mildew, so they continue smelling fresh and clean no matter how many times they are used. 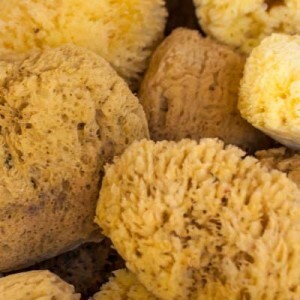 Sea sponges, with their exceptionally soft texture, have been used for bath and body use for at least the last 2000 years. Natural sponges create a rich luxurious lather, are highly absorbent and suitable for the most sensitive skin. And because sea sponges are so durable, they are ideal for daily shower, bath and spa use. Sea sponges should always be wetted before use, as they are stiff and often rough when dry. Sea sponges contain enzymes that naturally inhibit the growth of bacteria, mold and mildew. 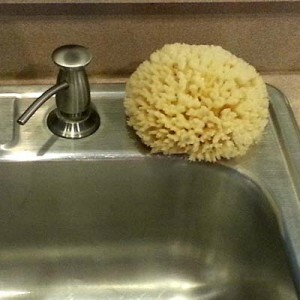 Synthetic sponges, unless they are chemically treated, collect bacteria and quickly begin to smell. Natural sponges are naturally toxin-free, hypo-allergenic, softer and more durable. And because they are resistant to abrasion, last longer than synthetics. Natural sea sponges soak up and hold more water, without dripping, and are self-cleaning. The intricate system of canals that make up the structure of a sea sponge allow them to be washed out more quickly and easily, and, in combination with a sponges natural enzymes, will keep them from retaining odors. Wool sea sponges (or lamb’s wool), are the softest, most absorbent and durable natural sponge available, and are eco-friendly. They are called “Wool” sponges because of their similarities in texture to the soft wool coat of a lamb. Its soft porous texture creates a rich luxurious lather and gently cleans while removing dead skin cells. Using a Wool sponge with a natural soap, body wash or scrub is an ideal way to clean the body naturally, without chemicals or additives. Also soft and gentle enough for bathing infants, Wool sponges are soft and gentle enough to use regularly on the face. Natural sea sponges are great for daily bath or shower and with normal use and proper care, can last for years. Yellow sea sponges are not as soft and silky as Wool, and are also slightly stiffer. While still soft, Yellow sponges are a better choice for gently exfoliating. Yellow sea sponges are the best tool for gently removing dead skin, dirt and oils. It is also a great way to remove the pollution and debris that accumulates on the skin over the course of time. Like all natural sponges, Yellow sponges are hypoallergenic and, unlike most synthetics, contain no chemicals or toxic ingredients. The stiffness of Yellow sponges make them the best choice for natural exfoliation. Choosing the right sponge for the right job is essential, and having an environmentally-friendly product available makes all the difference. 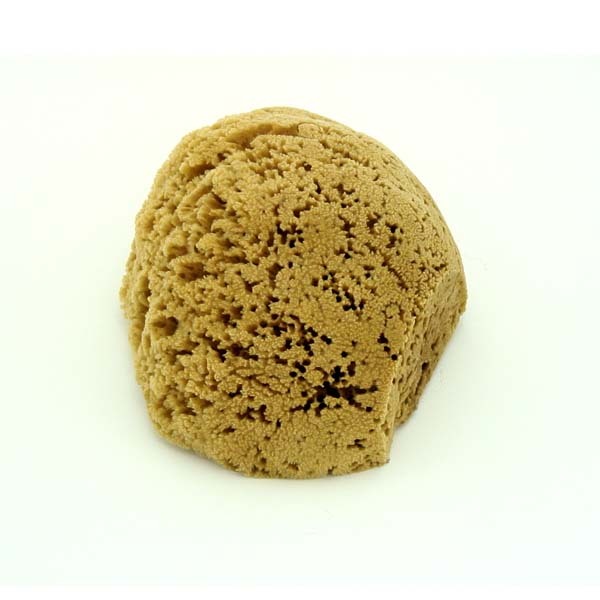 That’s why we offer these different types of high quality natural sponges. Sea sponges are a sustainably harvested, quickly renewable natural resource that is 100% biodegradable. They contain natural enzymes that naturally inhibit the growth of bacteria, mold, mildew and the associated odors. Because sea sponges are soft, absorbent, durable, non-toxic and hypo-allergenic, they are the best solution for natural skin care. Using sea sponges for baby care is the best and safest way to gently and safely wash infants and toddlers. Wool sea sponges are gentle and caressing on baby’s delicate skin. They are soft (when wet), hypo-allergenic, very absorbent, and produce a rich soothing lather. A sponge that is overly soft or insubstantial may require too much pressure to clean, while one that is too stiff or coarse may irritate a baby’s fragile skin. Natural Wool sea sponges are a perfect balance. They are soft enough to avoid irritation, while providing the texture and nap to thoroughly clean baby’s skin. Wool sea sponges are a natural healthy way to gently and effectively clean and care for your baby’s skin. Wool sponges are exceptional soft, highly absorbent and have a very low PH, making them ideal for delicate sensitive, young skin. Natural sponges are soothing and soft on baby’s skin, natural hypo-allergenic and toxin-free. Synthetic sponges, which are often made from, or with, petroleum bi-products, are routinely treated with toxic substances. Organic sea sponges contain natural enzymes that inhibit the growth of mold, mildew, and bacteria, making them a toxin-free and hypo-allergenic alternative for baby care. Using a Wool sea sponge with a gentile natural soap is an ideal way to clean the body naturally, without chemicals or additives. Sea sponges, which are are native to the coastal waters of Florida, and have been used by cultures all over the world for 2,000 years or more. Natural sponges are a sustainably harvested, quickly renewable natural resource and as with any natural product will vary in color, size and shape. Sea sponges should always be wetted before use, as they can be stiff and coarse when dry. Sea sponges should be thoroughly rinsed after each use and left to air dry. Natural sea sponge uses are many and varied. Sea sponges are one of the most versatile cleaning tools available and have been used for the last 2000 years by cultures all over the world. They are routinely used for many different types of jobs including baby care, bathing, cosmetic application and removal, wall washing, general cleaning, wallpaper application, hand washing delicate fine china, crystal and silver. Natural sponges are used by car, boat and aircraft enthusiasts to safely wash vehicle finishes, interiors and clean wheels and tires. Baby bathing is one of the most popular uses of natural sponges, as they are extremely soft and gentle on a baby’s skin and produce a rich soothing lather. Sea sponges are not only soft, absorbent and durable, they are also a hypo-allergenic and non-toxic solution for cleaning delicate skin. The same qualities that make these sponges popular for washing infants, also makes them ideal for adult faces and bodies. Natural sponges have also been used as a natural makeup remover for centuries. Natural sea sponge uses also include kitchen and bath applications. Using a sea sponge in the kitchen has many benefits over the commonly used synthetic sponges. Sea sponges, unlike synthetics, are naturally antibacterial, essentially self-cleaning (because of their pore structure) and, as a result, don’t develop the nasty odors normally associated with a kitchen sponge. In addition, they create a thick dense lather and hold an enormous amount of soap, which makes the job quick and easy. The same properties make it great for cleaning showers, tubs, counter-tops and tile. Vehicle detailing is also one of the great sea sponge uses. The incredible softness and nap of a sea sponge and the amount of soapy water they hold, protect the finish from marring or scratching by creating a buffer between the sponge and the surface. The porous nature and nap of sea sponges, pull dirt and grit away from the surface and into the pores of the sponge where they will not mar the finish. They are also great for cleaning wheels and tires because of the sea sponge’s ability to completely release the dirt and grit they collect. 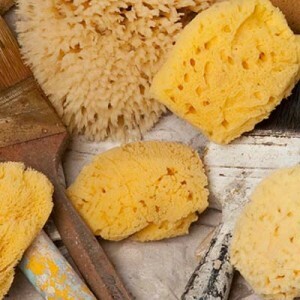 Painting or faux finishing is also one of the main sea sponge uses. The techniques are simple to learn, require no special equipment and create an unlimited number of effects. A newly popular use, is using natural sponges with military color paints to create different types of camouflage effects. Sea sponges are soft, absorbent, durable, non-toxic and hypoallergenic. Natural sea sponges, unlike artificial sponges, naturally inhibit the growth of bacteria, are 100% biodegradable, environmentally safe, economical, and a sustainably harvested, quickly renewable natural resource. They also have natural antibacterial properties. Maintaining a natural sponge is as simple as thoroughly washing with warm water and soap. They can also be washed in a dishwasher or be disinfected using both natural and synthetic disinfectants. Natural sponges cannot be disinfected with bleach products, as they will attack the fiber of the sponge, causing it to breakdown. All sponges are a dark brown when they are first harvested. It is only after processing that sponges take on the brown or light tan color that most consumers are familiar with. Processing sea sponges for use is a multi-step process that begins on the boats right after the sponges are harvested. The process begins with cleaning all of the unwanted tissue and any debris from of the sponge. Sea sponges are cleaned through a process that requires several steps. Once removed from the water the living tissue begins to breakdown. The sponges are covered with wet burlap and left on the deck for several days where the heat of the sun and the damp of the burlap help with the removal of the non-skeletal tissue; if the outer skin dries out and hardens, the sponges become worthless. The sponges are then squeezed, or “paddled”, to remove all of the unwanted tissue until only the skeleton of the sponge remains. During this messy cleaning, or curing, process, the tough outer black skin, gurry and the debris from the sponge’s canals are removed. The market price of a sponge is determined, in large part, by how well the sponges have been cleaned. After cleaning, the sponges are rinsed and hung to dry before being sent to a sponge processing warehouse. After arriving at the warehouse, the sponges begin the processing stage of preparation for sale. The raw sponges are first soaked in water and then partially dried to the point where the sponges are still damp, but the excess water has been removed. The damp sponges, which are easier to cut than when dry, are then trimmed to remove any remaining roots or any other unwanted portions. The trimmed sponges are then sorted by quality and those that are well-rounded and symmetrical are set aside to be processed and sold as “form” sponges, which are also suitable for decoration, and “cut” sponges that have more working surface area. Once the sponges are trimmed and separated, they are soaked in a weak solution of acid overnight to remove any remaining bits of root, skin, gurry, sand (or any other debris) that may have been missed in the other cleaning processes. The sponges are then removed from the solution and washed, often in large commercial washing machines, with a soda solution that not only neutralizes the acid and removes any remaining particles form the sponge, but also lightens the color of the sponge. The washing time and amount of acid used ultimately determine the color and texture of the finished sponge; this is the most delicate part of the process and requires a high level of skill and expertise. The sponges are then sent to the drying room and allowed to dry completely before being shipped to our retailers. The finished sea sponges (Wool, Yellow or Grass) are available in a variety of sizes, depending on the intended application. But all of our sea sponges are highly absorbent, inhibit the growth of bacteria, reusable, economical, environmentally safe and a 100% biodegradable sustainably harvested renewable natural resource. Natural sea sponges are harvested from the bottom of the ocean by fishing boats that specialize in sponge fishing. These boats are often owned and operated by families who have been sponge divers for decades, or, in some cases, even centuries. In many areas around the world, sponge diving has been a family tradition for thousands of years. Sea sponges are aquatic animals that cling to a hard surfaces on the sea floor such as rocks or coral and, once attached, do not move around. They are classified as animals, but have neither a central nervous system nor brain. The processed sponges that are sold and used for cleaning are only part of the animal. Living sponges are coated with a dark elastic skin that has pores through which they move water to feed or filter nutrients. Between the inner and outer skins of the living sponge is a gray gelatinous substance called gurry. Processed sponges have had the outer skin and the gurry removed from the structural element or skeleton of the sponge. And it is that skeleton that we use as a sponge. Sea sponges are harvested by divers using specially designed cutting hooks or knives. These leave enough of the base of the sponge for it to quickly regenerate. Once cut, the divers gently squeeze the gurry out of the sponge and take them back to the boats. The sponges are then pounded to clean them, and then covered with wet burlap sacks on the deck of the ship, where the heat from the sun releases a gas that rots the sponges’ skins so that they can be more easily removed. Sea sponges are harvested in many different countries using a variety of methods, but in the United Sates, sponges are harvested using sustainable methods that actually help the sponge population as a whole. Specially trained divers, who regularly and systematically rotate fishing grounds, sustainably harvest sponges by cutting the sponge to ensure that the base is left intact, which will allow the sponge to quickly regenerate. Rotating the harvesting or fishing grounds allows the sponges time for healthy and productive regrowth, without impacting the natural habitat the sea sponge colonies are harvested from. Scientific studies have consistently confirmed that the regular harvesting of natural sponges actually enhances the health and population of the sponges by increasing the population and removing older sponges. Properly harvested, or cut, sponges will re-grow within a few years, producing a bigger and healthier sponge than it was originally. Pieces of sponge that are broken off in the harvesting process that settle back to the ocean floor and reattach to a hard object, can regrow into completely new sponges. Studies have repeatedly demonstrated that harvested colonies actually increase in their population density, and through this practice the overall sponge population. This video explains the unique characteristics and best uses for Wool and Yellow sponges. Better understand which type of natural sea sponge best suited for your use. The Sponge Effects Natural Sea Sponge Paint Roller is used to create the same type of faux sponging effect, but in a fraction of the time. 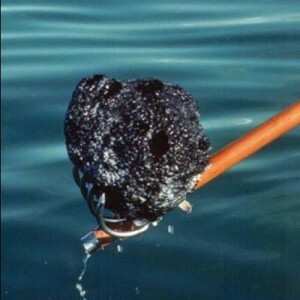 Florida Sea Grant contributes to Acme Sponge and Chamois' success by conducting research in the biology of marine sponges that helps ensure the sustainability of the commercial fishery.